This cozy cottage is roughly 1100 sq feet, nicely furnished and nestled on 11 acres of wooded land. After a long day of fun-filled activities, drift to sleep in one of the two cozy bedrooms with freshly-cleaned comfortable bedding. The modest kitchen is equipped with everything you need to prepare a fabulous meal. Relax on the deck, which has a barbecue grill and seating to enjoy nature at its finest. During the winter months, warm up with the wood burning stove and standard gas heating. During the summer months, cool off with air conditioned rooms and ceiling fans. For entertainment, we have a large flat screen TV with Apple TV, Netflix and all the premium channels. In addition, there is a Blueray DVD player with a vast collection of DVDs. High speed Wifi is available so you can stay connected to the outside world if you want. Otherwise, turn off those devices and listen to sound of the wind in the trees. The guests will have access to the entire house and 11 acres of property. You will be greeted at the lodge by your host at check-in and shown around the property. At that time, we will be happy to recommend local activities and attractions. We will leave you with our contact information in case you have any questions or concerns. Otherwise, you may enjoy the house to yourselves the rest of the time! 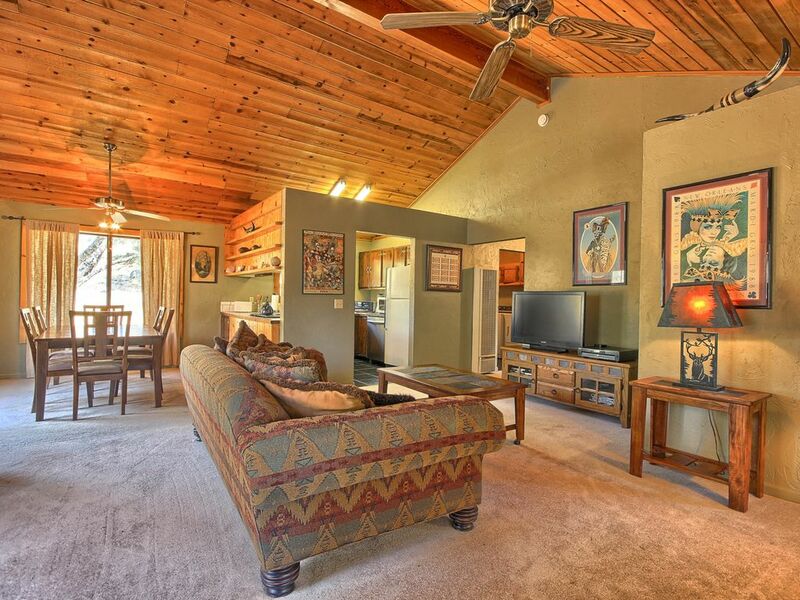 Mariposa is a quaint historic town located 20 minutes away from the property. The town has wonderful restaurants and bars. You'll find interesting shopping, including antiques and western/cowboy themed memorabilia. Located mid way between the towns of Oakhurst and Mariposa off Hwy 49. In either town there are large grocery stores and restaurants. 45 minutes away from with the El Portal or Mariposa Grove entrances to the magnificent Yosemite National Park. 30 minutes to Bass Lake, which is renowned for excellent fishing, hiking trails and warm waters. Wake borders flock to Bass Lake throughout the spring and summer as do boater, water skiers, paddle boarders, wave runner enthusiasts and more. I am currently living in Mariposa near Yosemite. A breath taking area as many of you know. I was trained as a tradtional french chef. Some of my interests involve horseback riding, hiking, juicing, Scottish Highlander Cattle and off roading. My father was traveling to Yosemite and made a wrong turn ... or should we say right turn. He found the area so charming that he called a real estate company and returned the following month to check out properties. He feel in love with this log cabin and the rest is history. Located on eleven acres this cabin gives you plenty of privacy with all the comforts and style you would expect from a modern lifestyle. The main room and each bedroom has with air conditioner. Wall gas heater in addition to wood stove. Each bedroom has a portable heater as well. Beautiful wood stove with glass front. 11 acres of beautiful grounds for you to explore. Bass Lake is about 30 minutes away and offers lots of fun water activities. Lake McClure is the second largest lake in California but it's not very developed. Great big house, amazing area, quiet, remote. 1 hour drive to Yosemete south ot west entrance. Beautiful views on both ways. We really loved this little place - it worked well for our needs for the few days we planned to be visiting Yosemite. I liked that the cabin was equidistant from both the El Portal gate and the South gate, and we utilized both. The space was clean, quiet, and had everything we needed for our stay. The communication was prompt and thorough. We had a great stay and will definitely return again if we get out that way! The house was very clean and well kept. Beds are very comfortable and the kitchen is well stocked. Definitely would stay here again if in the area. Rural location. Very comfortable cabin/cottage. Plenty of room with two large bedrooms. Could use a microwave oven, but kitchen was very efficient. 40 minute drive to Yosemite entrance. I always travel and rent cabins all over the states. This one is so far my favorite near Yosemite area. It is very private, with lots of space for your furry friends to run around. Isolated (very important to me when I choose a cabin). Cozy, furniture is nice. Beds are very comfortable. Wood burning stove and gas grill always a big plus. Just perfect! About 30 min away from Mariposa and about an hour away from Yosemite entrance. Will definitely rent it again next time we are in Yosemite. The cabin is quite dark during the day however it is very cozy at night with the fireplace going. The beds are comfortable. The kitchen is adequate.